Enjoy Living in this over 55 community. 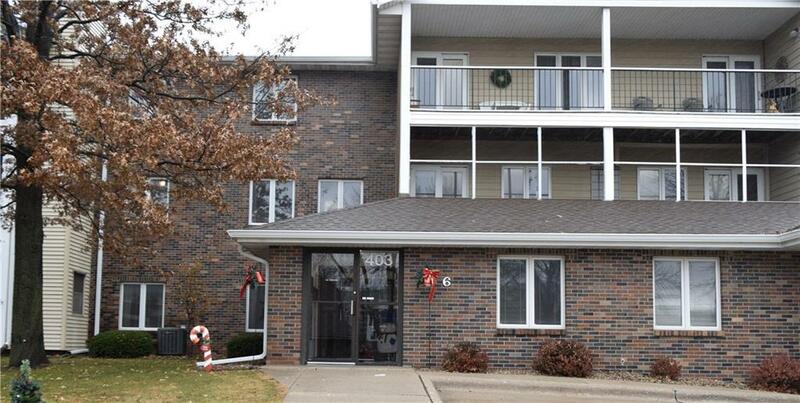 This second level unit features 2 bedrooms, one full bath, large living room, and kitchen. Kitchen has lots of cabinets and counter space. The attached porch is screened and private. Building is secure and equipped with an elevator. There is an assigned parking spot and storage closet in the heated garage. Building also contain a lounge and rec area. This unit also has access to a lodge area which features an indoor swimming pool, spa, jacuzzi, sauna, exercise room, and kitchen and is available for owners to host their own private parties. Association dues cover master insurance plan, trash collection, water use, snow removal, lawn care, exterior maintenance, lodge use and garden spot availability. No dogs. 1 cat is allowed. Listing provided courtesy of Century 21 Signature. © 2019 Des Moines Multiple Listing Service. © 2019 Des Moines Multiple Listing Service. IDX information is provided exclusively for consumers’ personal, non-commercial use and may not be used for any purpose other than to identify prospective properties consumers may be interested in purchasing. Data is deemed reliable but is not guaranteed accurate by the MLS or EXIT Realty Capital City. Data last updated: 2019-04-25T15:22:02.167.